Just the mention of this tender, aromatic dish sends Italian-food lovers into spasms of joy, and often, jags of wonderful (or dreadful, I’m afraid) childhood memories. If your Grandma made this dish, you either loved it or hated it, but there’s no getting around the fact that most adults can’t get enough of this one. Having grown up in a (mostly) kosher home–some of you know about the time Dad came home, a smoked ham in one hand and a box of gifts from his favorite customers in Chester, PA in the other, and demanded the end to this craziness (his words), and kosher in our house was no more–there was no eggplant Parmesan in our house. Mom occasionally made spaghetti sauce, but it was about as far from authentic Italian red gravy as salt-water taffy. I learned my sauce-making skills from the skilled chefs at the Epicure Market in South Beach, and refined them to a honed edge at the feet of an employer named Bud Bruno (the finest Italian chef I ever met) in his little kitchen in Ardmore, Pennsylvania. What I learned from Bud was the magic of fresh ingredients, really good olive oil, and little else–an authentic red sauce was at the same time simple and complex, with flavors that were meant to go together. And this one is light as a feather. Not much oil, no battering and frying of the eggplant, and you can eat as much as you want–it won’t weigh you down. This recipe doesn’t, however rely on one of those long-simmered, tradition-babied, fussed-over red sauces, but rather all the elements of a perfect red sauce, blended together with love but not with much time or effort. Just toss the ingredients together in a bowl and let ’em marry in the bowl for a while. Then go. Here’s the recipe, and be gentle. Don’t over think this one. It can’t really be much simpler. About three hours before serving, sauté the onions and garlic with the good olive oil until tender and transparent, 8-10 minutes at medium heat. In a medium bowl, stir together tomatoes and their juice, basil, parsley, wine, vinegar, salt, pepper, garlic, and onions (from here on I’ll call this the sauce). Cover with plastic wrap and set aside. An hour later, preheat the oven to 400°F. Line two or three baking sheets with foil. Spray the foil with olive-oil cooking spray. In a shallow dish, beat the egg whites and 2 tbsp of water until foamy, and prepare another shallow dish with Panko. Dip eggplant into the egg whites, then into the bread crumbs, pressing crumbs into the eggplant. Place the eggplant slices on the prepared baking sheets and spray oil lightly over the slices. Bake 30 minutes, turning over after 20 minutes, until golden brown and cooked through. Spoon 4 tbsp of sauce into bottom of 9″ square glass baking dish that has been sprayed with olive oil. Place half the eggplant over the sauce; spoon half of remaining sauce over the eggplant; and sprinkle half of mozzarella on top. Repeat with remaining eggplant, sauce, and mozzarella. Sprinkle Parmesan on top and bake for 20-30 minutes, or until eggplant is piping hot, the sauce is bubbly, and the cheese has to lightly brown. 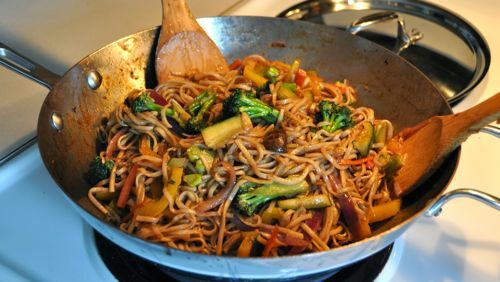 This dish will serve 4 generously, and leave you with a couple of pieces leftover for lunches the next day. I adapted the recipe from one featured on his “Good Eats” show a couple of years ago by Alton Brown, that wacky TV chef at the Food Network. It looks really good to me, so I thought I might try it. I’m a big fan of panzanella, and this recipe demonstrated to me that it’s not just a summer salad. Beautiful root (and winter squash–Alton used shredded Brussels sprouts in his recipe instead, but no one here likes them!) vegetables, a fine sourdough bread, and some fresh herbs from my garden (yes, it is still producing!) make for a really fine-looking and grand Christmas dinner, a wide stray from the usual rib roast and Yorkshire pudding from years past. Here’s what’s for dinner tonight. For the turkey: Four days before service, place the salt, sage, thyme, black peppercorns, and allspice into a spice grinder and pulse until the peppercorns and allspice are coarsely ground, 5 to 6 pulses. Set aside. Set the turkey, breast-side down, on a large cutting board with the tail closest to you. Use an electric knife or heavy-duty kitchen shears to cut up one side of the backbone. Turn the bird around and cut back down the other side of the spine. Reserve the backbone for Giblet Stock. Discard any fat pockets or excess skin found inside the turkey. Turn the turkey breast-side up and use the heel of your hands to press down on both breasts, until you hear a cracking sound and the bird has flattened slightly. Rub the seasoned salt on both sides of the turkey. Place the turkey on a parchment paper lined half sheet pan, breast-side up with legs running with the long side of the pan. Store, uncovered, in the refrigerator for 4 days. Remove the turkey from the refrigerator and leave at room temperature for 1 hour. For the panzanella: Place the parsnips and rutabaga in a large bowl, toss lightly to coat with the oil, and set aside. Place one rack in the middle of the oven and a second one far enough below so the roasting pan will fit. Heat the oven to 425 degrees F.
Place the turkey directly on the middle rack of the oven with the legs perpendicular to the metal bars of the rack. Place the roasting pan with the parsnips and rutabaga on the rack below the turkey and roast both for 30 minutes. Reduce the heat to 350 degrees F. Add the red onion to the roasting vegetables and stir to combine. Continue to roast both the vegetables and the turkey until a probe thermometer inserted into the thickest part of the breast registers 155 degrees F, an additional 40 to 50 minutes. Remove the turkey from the oven onto a cooling rack set inside a half sheet pan and rest for 30 minutes. Add the butternut squash, bread cubes and garlic to the roasting vegetables, stir to combine and roast for an additional 15 minutes. 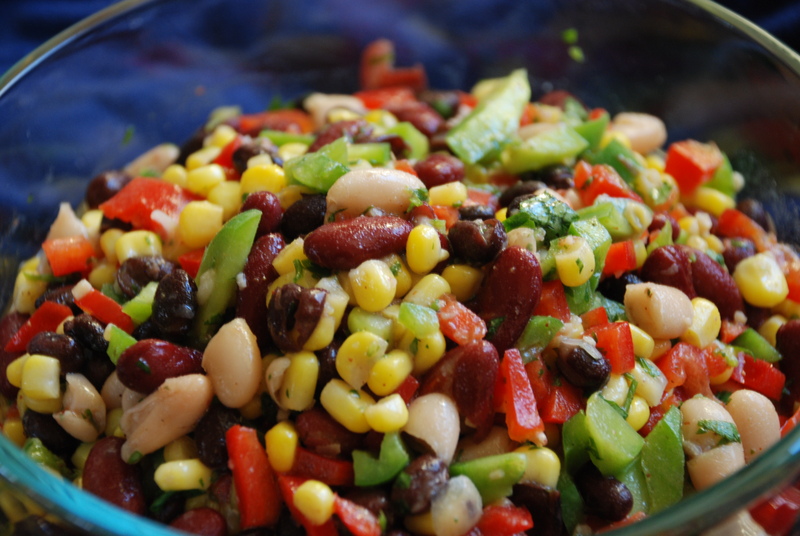 Remove the vegetables from the oven and immediately transfer to a serving bowl. Pour the apple cider vinegar in the warm roasting pan, stir and scrape off any browned bits from the pan. Pour the vinegar mixture over the salad, add the thyme and toss to combine. Season with salt and pepper as desired. Serve warm or at room temperature. Carve the turkey and serve with the panzanella. Heat olive oil in a saucepan; add mushrooms and saute’ until limp. Add barley, stock, green onion, and rosemary. Bring to a boil. Reduce heat to low, cover and cook 45 minutes, or until the barley is tender and the liquid is completely absorbed. Sprinkle Parmesan cheese over pilaf and toss to mix well. Garnish with a little more Parmesan and some fresh-chopped green onions. 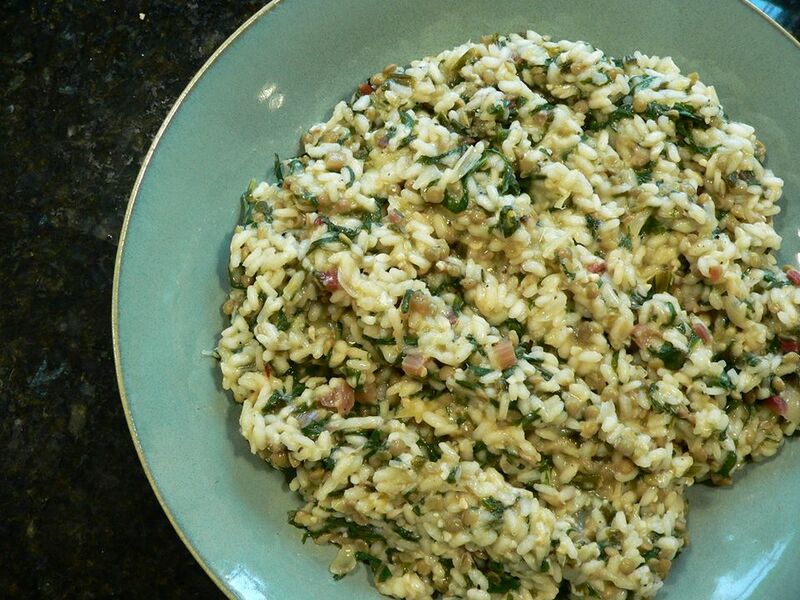 We’re serving this with fresh green beans sauteed in butter with sesame seeds and cranberry-orange relish. 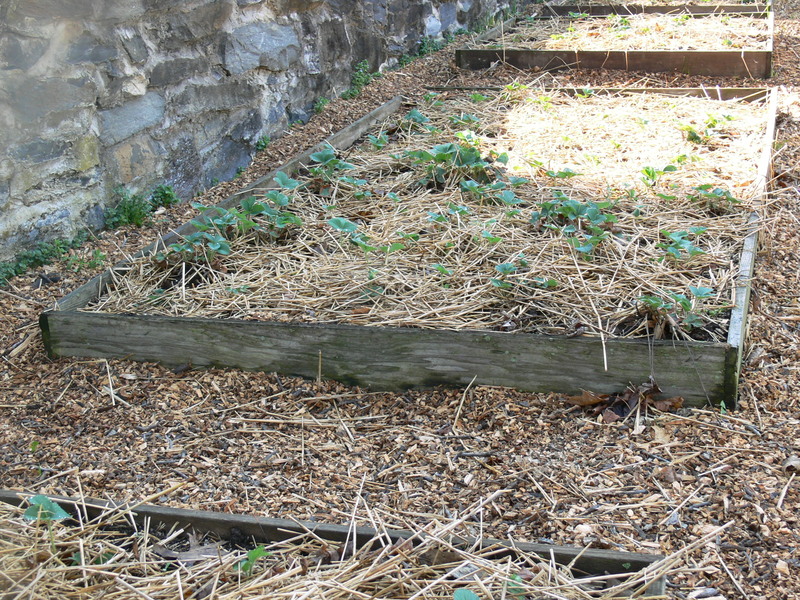 This week I met my farmers, and I walked the ground where my spring, summer, and autumn vegetables will grow. We joined a CSA this week, so we will be receiving regular bags full of produce—from mustard greens to watermelons to butternut squash and virtually everything in between—from a tiny but growing farm in Willow Street called Blue Rock Farm. And the farmers, Caitlin Brady and EmmaKate Martin are not what you’d expect. Caitlin Brady, 22, is the creative force behind the Blue Rock Farm. She was raised in Missouri on a 2000-acre farm that grew corn, soybeans, sorghum, and tobacco, using large machinery and production-farm techniques that are common to business farms all over the country (not that there is anything wrong with that). She’s been to five different colleges (currently Millersville University as a foreign-language major—Spanish, French, and Italian), she’s lived in several countries; and in big cities (Chicago) and small farming communities like Lancaster. Caitlin started Blue Rock a couple of years ago and sold her products at several of the local farm markets—this year she will have a stand at the Eastern Market on East King Street on Saturdays. EmmaKate grew up on the land she and Caitlin are currently farming. In fact, the land has been in her family for 6 generations. She graduated from Penn Manor High School and is now working the same land her father and her grandfather did, and further and further back. EmmaKate is also passionate about the land we all live on, and works with a volunteer organization that holds concerns for the environment as acts of faith. In a conversation with her spry 94-year-old grandfather, Park Mellinger, the other day, he told me how pleased he was that she and Caitlin were doing this kind of work. 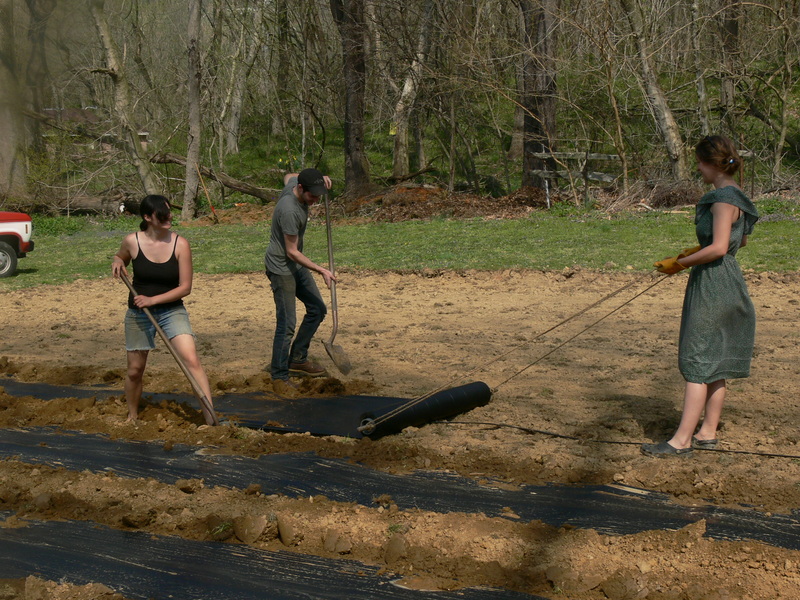 He told me that the plot they were currently working in was plowed under for planting for the first time since 1899—it’s been backyard to the farm house for generations. Blue Rock farm is totally organic; the fertilizer is compost and the water is rain water collected in large containers all over the property and fed into the gardens through drip hoses. 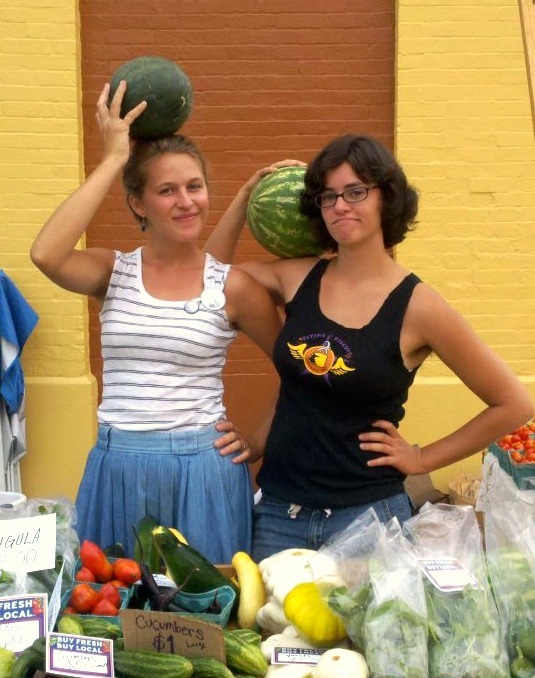 Caitlin and EmmaKate are making a serious go of this small family farm, currently having 15 half- and 6 whole shares in their CSA, which will deliver food weekly to three Lancaster County locations. A limited number of shares are still available. The New York City chef Dan Barber, a loud and passionate advocate for small, local, organic farms—he runs one himself in upstate New York that produces for his restaurant—encourages consumers to “get to know your farmer and your fishmonger,” so that you will know exactly where your food comes from and on what it’s been raised. I have gotten to know my farmers and I, for one, couldn’t be happier. I know that my family will be eating some of the best, healthiest food available in Lancaster County, a place where there is more healthy food (and some pretty unhealthy stuff, too) than almost anywhere else in the nation. Blue Rock Farm. Check it out!